1. Cuban artists, whether they are graduates of artistic education, general education or amateurs, in order to practice professionally, have to be qualified by the State. 3. Artists will be required to establish links with a State institution in order to receive remuneration for their work. Those who don’t comply with this policy can be subject to disciplinary measures by their work institution, including measures that affect their economic support. 4. Only institutions that are authorized by the Minister of Culture or the Cuban Institute of Radio and Television can establish work relations with artists and represent them to market their productions and artistic services in public. 5. Artists will not be able to benefit from productions or shows, or develop and expose their skills, talents and artistic attitudes in public without State authorization. Nor can they express their identity using national symbols. People who are not considered artistis are excluded from access to practices, benefits and cultural services. 6. State officials have it within their discretion to decide if a book doesn’t comply with ethical and cultural values; if audiovisuals, music or artistic presentations promote discrimination, violence or use sexist, vulgar and obscene language. Victims, affected groups, denunciations or guarantees of due process are not required for accusations. 7. State supervisors and inspectors will decide, at their discretion, if fines between 1,000 and 4,000 pesos or confiscation of goods are merited. Both measures can be applied to any person, organization, business, etc. “in places of State and non-State public installations,” which do not comply with the policy stablished by the Ministry of Culture. They also can suspend, immediately, any show or film and request cancellation of authorization for independent work activity. 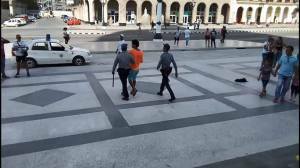 On the afternoon of July 21, 2018, Luis Manuel Otero Alcántara, Iris Ruiz, Amaury Pacheco, Soandry del Río, Yanelys Nuñez Leyva and José Ernesto Alonso met in front of Havana’s Capitol building, contrary to the regulations of Decree 349 / 2018 that violates and restricts the freedom of artistic creation. Along with José Ernesto Alonso, Iris Ruiz was released four hours later, accused of creating public disorder. Luis Manuel, Amaury and Soandry were transferred to the Vivac detention center, where they are accused of public disorder and aggression. We remind the Cuban State that the freedom to comment on public issues without censorship or limitations, as well as to inform public opinion, is indispensable to guarantee the full exercise of participation in public affairs, which includes the freedom to hold peaceful demonstrations and gatherings, to criticize or oppose the government, and to publish political material. The arrest of the artists is arbitrary, irrational, unnecessary and disproportionate, because it violates recognized international standards in relation to the guarantees of due process. The procedure for legal detention in Cuba allows for arbitrary detentions, currently used by state agents as punishment for the legitimate exercise of freedom of opinion and expression, assembly and association, recognized in international human rights law. States have the obligation not only to abstain from violating the rights of people who take part in a meeting, and to respect and guarantee the rights without any discrimination for prohibited reasons or of any other nature or any other condition of political opinion. The freedom to organize and participate in public meetings must be guaranteed to all natural persons, groups, non-registered associations, legal entities and companies. In Cuba, access to public participation spaces is excessively and abusively restricted, as a result of which the full and free exercise of the freedom of peaceful assembly is practically impossible. Cubalex demands that the Cuban State immediately release artists Luis Manuel Otero, Amaury Pacheco and Soandry del Río, and adopt urgent measures to protect human rights defenders against reprisals and eliminate undue restrictions on the use of public spaces. Cubalex, 19 July 2018 — Indira Martínez Borges, 33 and the mother of a two-year-old, will be tried on July 20 in a summary proceeding, charged with the crime of “contempt” for calling an official ‘corrupt’. The official, Anais Rodríguez Cárdena, is with the Provincial Directorate of Housing of the Camagüey municipality, which confiscated Martinez’s home and assigned her another in poor condition, for which she had to pay. Cubalex is concerned over the incompatibility of these summary trials with the right to a defense. Martínez will be tried without the advice of a lawyer. Only if the court concurs to a trial with a Defender, will it allow the participation of one. Nor does Martinez have the resources to hire a lawyer from the National Organization of Collective Law Firms (ONBC). Even if the accused can hire a defender, their right to defense would be violated. The legal services contracts of the ONBC are the only ones accepted by the court, a situation that affects the right to freely choose a lawyer. In these summary proceedings, the ONBC lawyers do not even attempt to request postponement of the oral hearing, knowing that they have not had time to prepare their defense or access to the investigation file. On July 17, the Special Rapporteurship for Freedom of Expression of the Inter-American Commission on Human Rights (IACHR), in a press release, expressed its concern over defining criticism of public officials in Cuba as a punishable crime. The Rapporteurship referred expressly to the cases of Ariel Ruiz, a doctor of Biological Sciences, that of Eduardo Cardet Concepción, coordinator of the Christian Liberation Movement (MCL), and also the case of Martha Sánchez González, member of the Ladies in White. All three were tried and imprisoned for this same crime, which undermines the freedom of thought and expression, and constitutes a mechanism to silence the pluralistic and democratic debate around the management of the government . The Rapporteurship of the IACHR claims that the crime of contempt lends itself “to abuse, as a measure to silence unpopular ideas and opinions, which restricts a debate that is fundamental for the efficient functioning of democratic institutions.” It notes that in the majority of nations in the Americas the crime of contempt has been eliminated from the criminal legislation. The Office of the Special Rapporteur for Freedom of Expression is an office created by the Inter-American Commission on Human Rights (IACHR), in order to stimulate the hemispheric defense of the right to freedom of thought and expression, considering its fundamental role in consolidation and development of the democratic system.